The road has been a bumpy one for the Charlottesville area over the past year as it made national and international news in ways no one could have imagined. The bad news seemed to come in rapid fire. Searchers found the body of second-year University of Virginia student Hannah Graham in October in Albemarle County. She had been missing for about a month. “For Hannah’s young life to end so tragically, and for her destiny of promise to be left unfulfilled, is an affront to the sanctity of life and to the natural order of human events,” U.Va. President Teresa A. Sullivan said. Jesse Matthew, a former U.Va. hospital aide, was charged with capital murder in the death of Graham. Police say forensic evidence also links Matthew to the 2009 disappearance and death of Virginia Tech student Morgan Harrington. The disturbing events framed a tumultuous year in which local issues also came to the forefront. Residents and businesses, for example, battled over how to fix Route 29 North, a congested stretch of road that some call Albemarle County’s main street. Nonetheless, the local economy continues to thrive, with one of lowest unemployment rates in the commonwealth and a long list of major construction projects. With a long-debated western bypass defeated by its foes, the newest Route 29 project calls for separating traffic on the highway from traffic on Rio Road by replacing the at-grade intersection with a grade-separated intersection. The intersection is one of the biggest in the state in terms of number of lanes. According to Virginia Department of Transportation officials, “four through lanes (two in each direction) will be constructed underneath Rio Road to carry traffic with destinations north or south of Rio Road. Local lanes will be built to the outside of the through lanes so traffic with local destinations can leave Route 29 onto Rio Road or access the businesses near the intersection.” Preliminary work on the interchange already has begun. The $84 million interchange is part of a $231 million project, which also includes widening one section of Route 29 and construction of a 2.3 mile-long extension of Berkmar Drive, a heavily traveled local road. Route 29 serves as a major link between Northern Virginia and Southern Virginia. Cities to the north and south of Char­­lottesville have lobbied for a solution to the congestion in the Charlottesville area. Construction of the interchange is scheduled to be completed by the end of 2016. Opponents of the plan said it will destroy dozens of businesses clustered around the interchange because the months of construction — including road closings and detours — will scare away shoppers. The owners of Albemarle Square shopping center — at one corner of the interchange — and a Wendy’s restaurant on Route 29 filed a federal lawsuit in March asking that the project be halted until the state conducts an environmental impact study. The suit is scheduled to be heard in federal court in Charlottesville in June. Meanwhile, the Charlottesville leg of the John W. Warner Parkway opened in February after nearly three years of construction, allowing residents in northern Albemarle County to drive quickly into the heart of the city. The parkway, also delayed by a lawsuit claiming violation of federal law, often is backed up during morning and evening commutes, leading some critics to say the two-lane road already is obsolete. 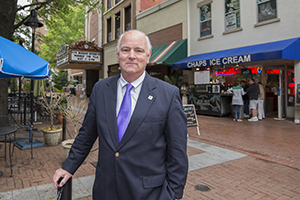 Overall, however, Charlottesville is booming, with the downtown pedestrian mall boasting a 98 percent occupancy rate, says Chris Engel, the head of the city’s economic development department. Another hotel, the Marriott Residence Inn, offering 133 rooms at the corner of Ridge and West Main streets, will open for business by early next year, Engel says. Also on West Main, a five-story, 600-bedroom apartment building called the Flats at West Village opened in August and is aimed mostly at housing U.Va. students. “West Main Street is a hot spot for development,” says Engel. The city, where downtown parking always has been an issue, is debating whether to install parking meters around the mall to better manage traffic. “From a retail standpoint it increases customers, but residents and visitors have a different perspective,” says Engel. City Council will decide soon about the meters. In Albemarle County, T-shirt maker CustomInk, which opened in 2011, “has been rapidly expanding,” says county spokeswoman Lee Catlin. The operation now has 235 employees and plans to hire another 40 this year. The company produces 10,000 T-shirts each day. Major stores also plan to open in the county. Wegmans is set to open an upscale supermarket next year at the Fifth Street/I-64 interchange in a new development called the 5th Street Station. Costco will open at the Shops at Stonefield on Route 29 this year, Catlin says. Shops at Stonefield has 21 businesses open now and is more than 50 percent completed. When finished, Stonefield will be the second-largest shopping center in the county, behind Hollymead Town Center, once the center is fully built out, Catlin says. Craft-beer brewing also is growing in Albemarle. In the past two years, Champion Brewing Co. has gone from two to 10 full-time employees and from 500 barrels of beer a year to 3,000 barrels. The brewery expects to produce 7,000 barrels this year. Another growing business, Frontline Test Equipment, recently signed several major automotive contracts. Frontline is an employee-owned company specializing in Bluetooth technology application. The expansion resulted in the company adding up to 58 employees in the county and opening offices in China, Britain and Ireland, Catlin says. At U.Va., a renovation of the Rotunda, the university’s signature building, continues. The $52 million project included replacing the dome roof in 2013 and installing 10 marble capitals on its columns during February. The building will reopen next year with new mechanical, safety and security systems and expanded classrooms and study space. The construction of a dormitory named Gibbons House also is underway, continuing a long-term project to replace 1960s-era residence halls in the Alderman Road area. The dormitory is named after William and Isabella Gibbons, a couple enslaved by professors in the 1850s. It’s the first building at U.Va. named for slaves. A project that could cost up to $394 million, including the renovation and expansion of the U.Va. Medical Center’s emergency department, will soon be underway. The emergency room had 58,000 visits last year, stretching the facilities to the limit, says spokesman Eric Swensen. The project will expand the ER’s bed capacity from 43 to 80. “Because many of our patients initially enter the health system through the emergency department, we want to create the best-possible environment to receive care and, for our team members to provide high-quality care,” says Pamela M. Sutton-Wallace, the medical center’s CEO. “We believe this project will create a real community asset.” The expansion should be done by the summer of 2019. The project also includes plans to build a “bed tower” that will enable the medical center to convert most of its semi-private rooms into private rooms. Six stories would be constructed on top of the emergency room. Three floors would be used to create private patient rooms, while the remaining three floors would be unfinished space reserved for future needs. The bed tower should be completed by December 2019. In surrounding counties, Fluvanna voted in early April to approve plans to build an intake facility at the James River to withdraw 3 million gallons of water a day. The joint venture with Louisa County is aimed at luring businesses to the Zion Crossroads area. In Greene County, a $30 million expansion at the Insurance Institute of Highway Safety (IIHS) will be finished this spring. The expansion is expected to be an economic boost to the county when workers at IIHS’ Arlington headquarters move to Ruckersville. The project includes the addition of an outdoor car track and a 5-acre indoor test track. IIHS is an independent scientific and educational organization focused on reducing the number of deaths and injuries from automobile accidents. Topping the overall good economic news for the Charlottesville region is the latest housing report from the Char­lottesville Area Association of Realtors. The report shows median sale prices are up 5.1 percent and sale contracts are up 18 percent this first quarter compared with last year’s — proof that buyers, finally, are back.